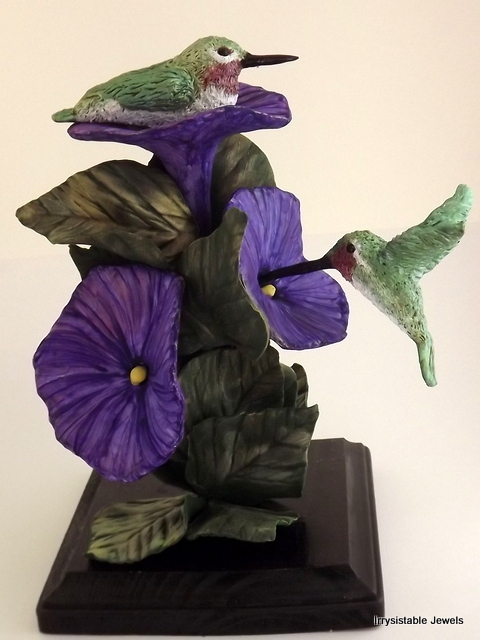 With much trial and error I have finally finished this sculpture. I learned so much in doing this one and made a ton of mistakes. I’m hoping that I remember those goof ups next time. I plan on trying to recreate my Grand-Daughter next and I’m sure that will be full of special challenges too but I’ll give it a go and see what happens. I hope you’ll follow me along the way and maybe learn something too. I’m going to post step by step pics of the process so you can see how I do it from the very beginning. 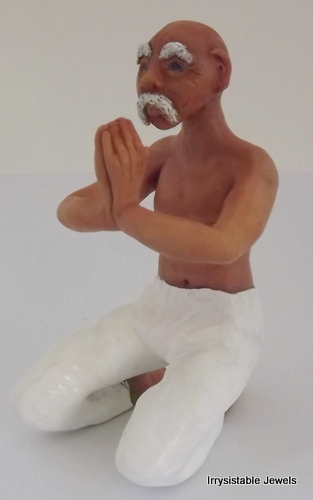 I have ordered some supplies and as soon as they arrive I’ll be starting the new sculpture. Should be around Wednesday or Thursday I think. A good friend on mine (Harry Wood of Oscar crow) has offered to send me an anatomy book which will help a great deal in getting things right and in proportion. He’s so helpful and knowledgeable. Check out his blog for tons of tutorials. http://www.oscarcrow.blogspot.com/ I highly recommend it! This is the photo I plan on basing the next creation from but as you all know that can change when flubs appear..LOL Isn’t she adorable! This is actually an old photo of her but it’s one of my favorites. I have decided to start a blog over at Blogspot and it’s already up and running. I still have some tweaking to do on it but I’m working on that now and over the next couple of days. This blog will remain running and I might post in it from time to time but the new one will be my main blogging place. I hope you will all follow me there. I’ll be posting some video tutorials there soon too! It’s going to be a whole new adventure and I’m really looking forward to it. 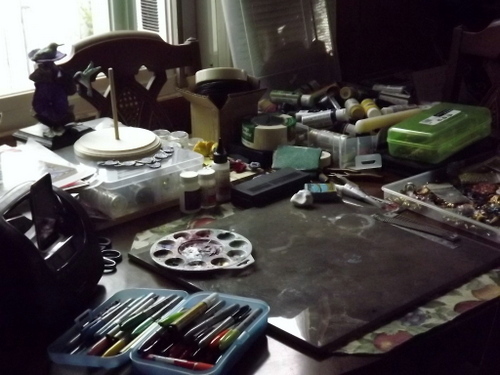 Wow, my space is even messier than I thought, and hey, there’s that wire I was looking for yesterday. 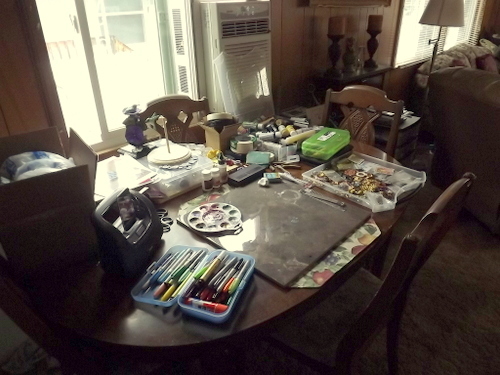 I should take pictures of my table more often, might help me find lost items faster. 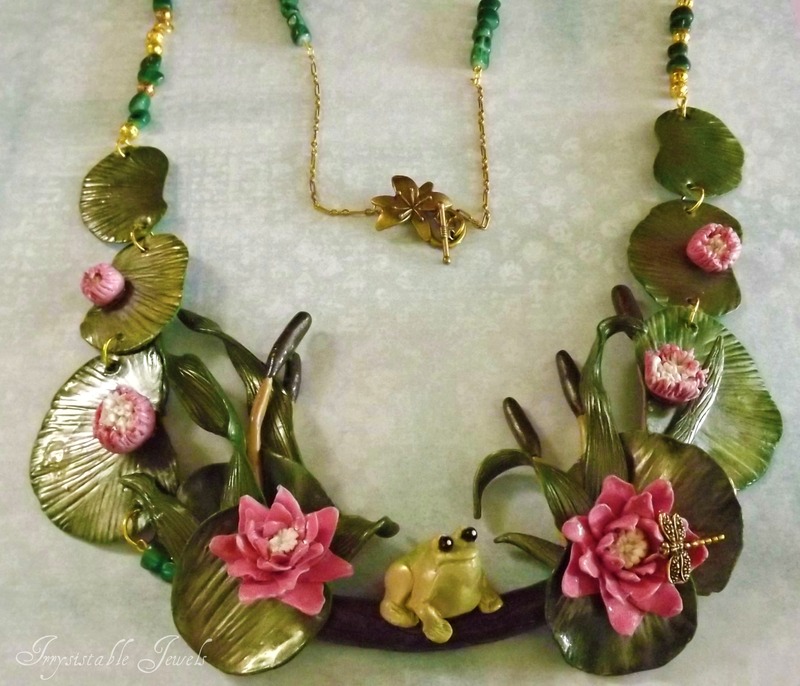 What a great Blog Hop idea Brenda Sue of Bsue Boutiques had with this. I wonder who’s space will be the messiest? Should we have had a contest on that? My guess is the one with the largest amount of space would win it since there’s more room to spread stuff out and lose it in. I know I always wish for more space but then I look at this mess and realize it would just grow and soon I’d be featured on an episode of Hoarders I tend to keep everything and nothing is where it should be most of the time. 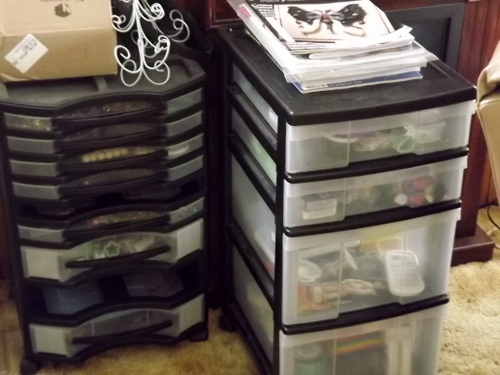 I actually have a spare room I could convert but that’s where my sewing stuff is at the moment. I guess I have too many hobbies and not enough rooms. Yup , that’s right folks Irrysistable Jewels is really created on just a small table in my living room. I tried to win the lottery so I could have the space of my dreams but didn’t even get 1 number in that. I’ve seen some beautiful spaces, all decked out with pretties on the walls and beautiful stuff to look at everywhere for inspiration. I guess I am inspired by my lack of these things to create something beautiful instead and that works for me. I do have to remember to push the chairs in before I leave since my little dog got up there and ate some yellow clay the other day. Little stinker! So much for my making daffodils until I get the store for more yellow clay anyway. 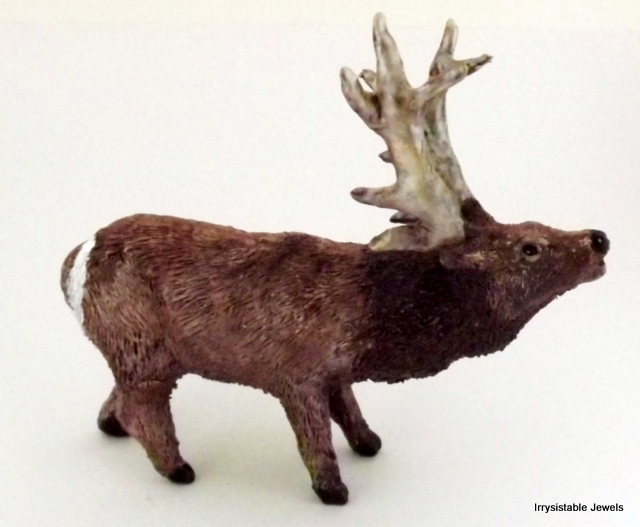 I love sculpting Polymer clay and thankfully it doesn’t require too much room to do it. 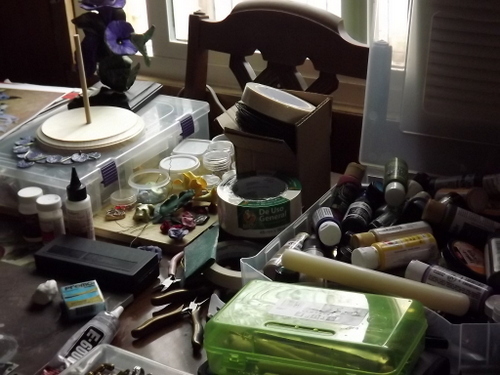 When the weather is nice I can take a TV tray and sculpt out on the deck in the sunshine. Feeds my creative side and feeds my body with Vitamin D to boot! See there, now I’m trying to claim the porch for my creating space, Ha, hubby better watch out or he’ll be out in the dog house soon. I’d love to move all his tools out of the shed and set up shop in there as well but I think he might protest that idea. He’s very good-natured but I could be crossing a line there for sure! 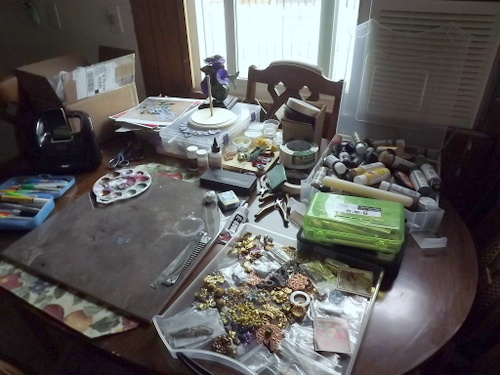 I’ve been selected to showcase my creations for RAW Artists in Portland Oregon on May 24th at the Bossanova Ballroom so my workspace is especially messy at the moment in preparation for that event. I’m extremely excited about it and nervous at the same time. Tons of work to get finished for that so it’s keeping me away from creating for now. Hopefully, I’ll be able to complete the Booth part of it and get back into sculpting in a few more days. I’ve got a few ideas for new creations rattling around my head that are just dying to be created. 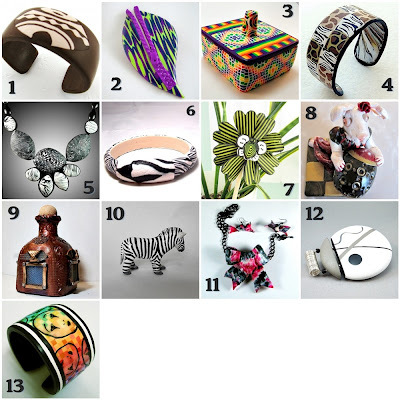 Here’s a few pieces that will make it into the show. I know I’ve said that I plan on developing some tutorials for you and I DO intend on completing those when I get back. Looking forward to getting some of those done as well. I’ll be listing some new items in my Etsy shop when I return too so keep an eye out for those. It’s been a very busy couple months for me but I expect things to slow down enough soon for me to accomplish all of my ideas. 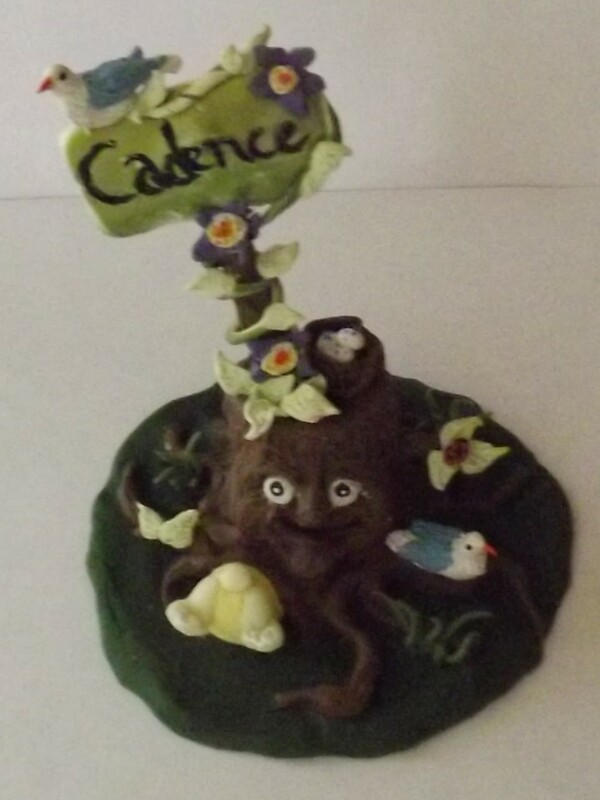 Last month I entered the Polymer Clay Central challenge and won 2nd place with my Bird in the nest piece. I am entered in the PCAGOE Monthly challenge this month too. I’ll post the link for that challenge when it’s up and running. Should be in the next couple days. Visit my Facebook page for more information on Challenges as well. The PCAGOE is a wonderful group of talented people and I feel honored and fortunate to be included in this group. I’m sure I’ll be learning tons of new things as I interact with everyone there. 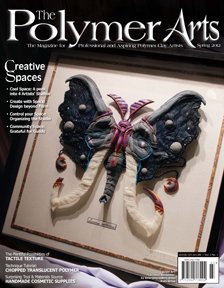 Have you checked out the new issue of The Polymer Arts magazine yet? I did, and I must say it’s a fantastic read and full of wonderful information and stunning pictures! It’s a must read for the serious Polymer clay artist in my opinion and it will only get better over time. I love the cover photo! I’ve finally finished my newest creation and this one was quite a challenge. I love how it turned out though. 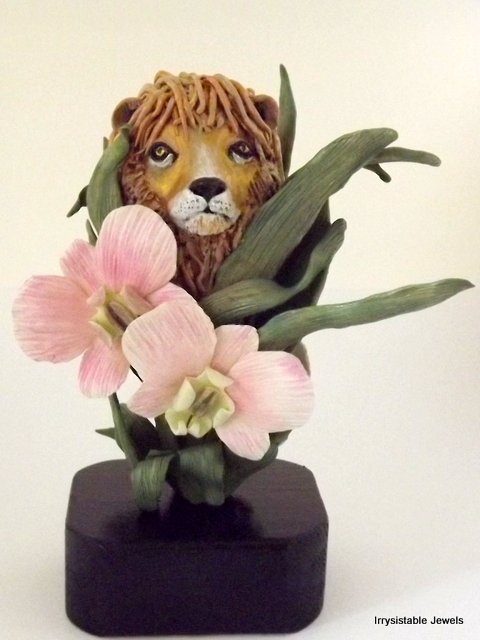 Flowers have always been a love of mine so it’s a natural marriage with clay. 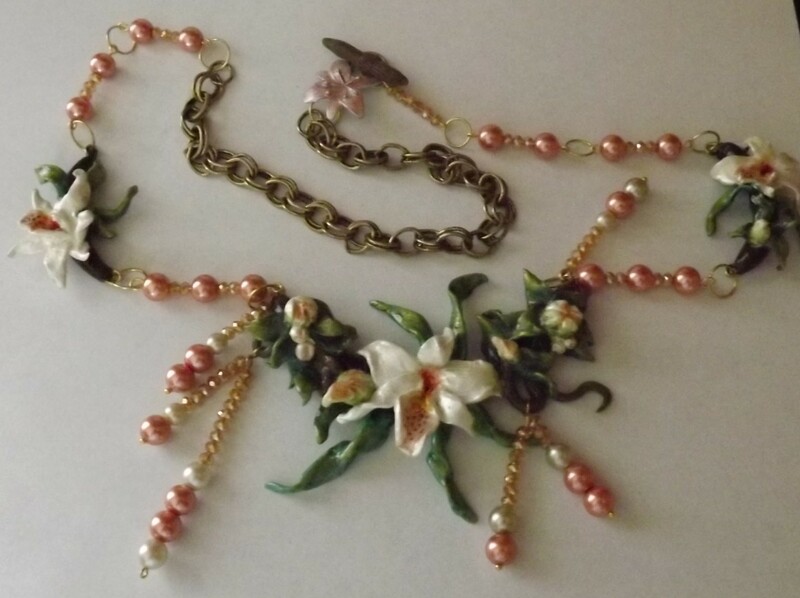 I’ll be writing an essay today to submit to a flowers contest along with a photo of an Orchid polymer clay necklace. I have no idea when I’ll hear from them in regards to this contest but I’m super excited. I only wish I could share the picture with you. Maybe you’ll be seeing it in Polymer cafe soon. Check out my Facebook page for updates on the contest and other submissions I’ve been working on. I need to spend some time on my website this afternoon and get it all updated. I’ve been so busy creating I haven’t paid much attention to it. I’ve also got some ideas for a couple of tutorials I need to get started on. I’m trying to get a handle on the video aspect for those so stay tuned for that. Have a wonderful day and thanks for stopping in to see my blog. 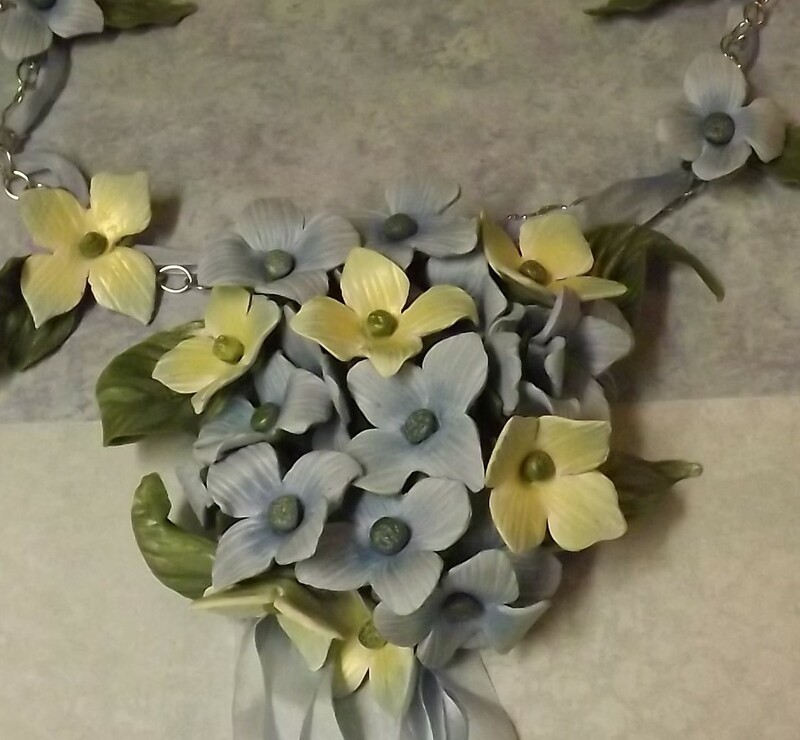 I’ve been very busy creating some polymer clay flowers the last few days. Taking my cake decorating skills and transposing them into clay has been an experiment to say the least but it does work with a little tweaking. I made this Star Gazer lily a couple days ago and applied some watercolor paint to it. I love the soft effect I achieved. Today I made a smaller version and painted it with powders so I could compare the two and decide which one worked best for florals. I must say I think I like the watercolor effect best but they both look good. Currently I am working on another necklace for a magazine submission using the Star Gazer as the focal. 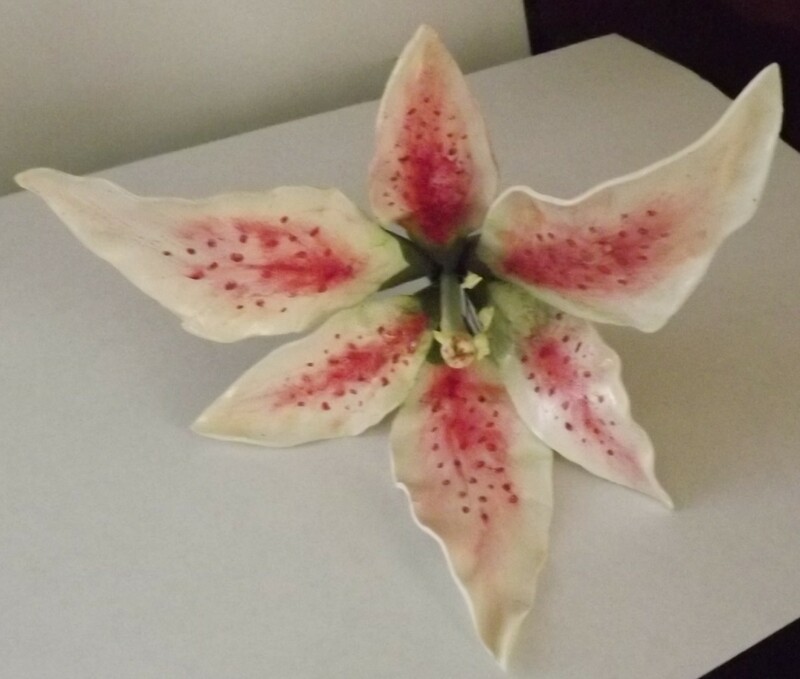 I’m thinking about posting a tutorial on this Lily in the near future so if you’re interested in that please leave me a comment at the end of this blog. My Granddaughter’s birthday is approaching soon, so rather than buying her something, I created a special little sculpture for her. Sure had fun with this one and I’m sure she’ll love it. I can see some Christmas Ornaments coming at some point. Those should be really fun to create. Little kids love to see their names on things and my Grandkids are no different. I love making things for them! 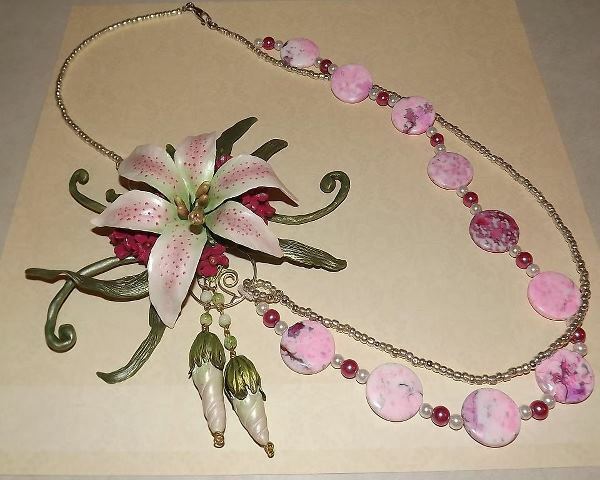 Here’s another floral necklace I created a few days ago. I would do this one a little different next time though. I should’ve surrounded the petals with some baking soda to keep them from drooping. Live and learn I suppose. I’ll be listing this one in my Etsy shop in a day or so. Still have a few things to finish on it first. 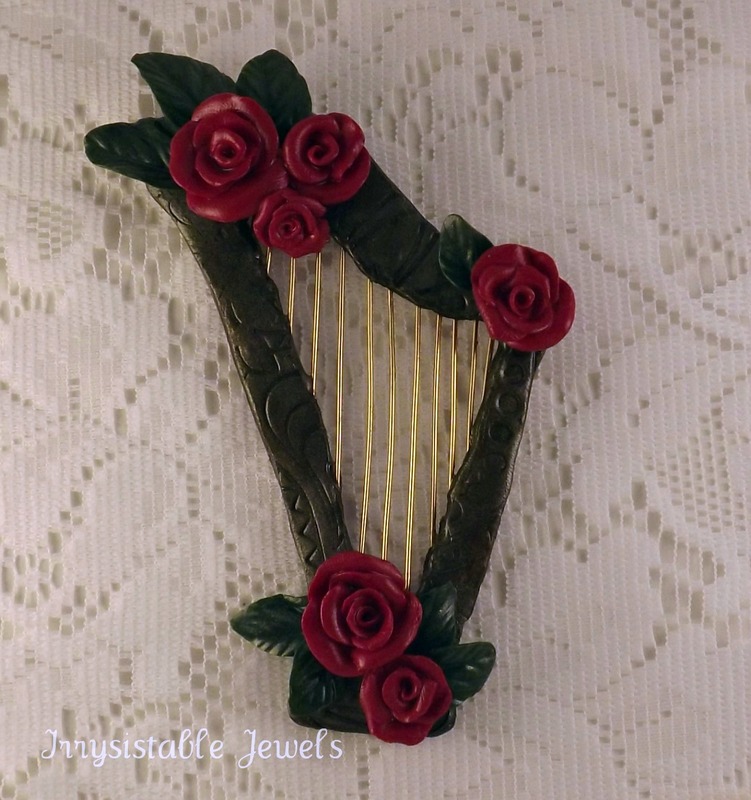 I love working with polymer clay! It’s the best stress reliever around if you ask me. 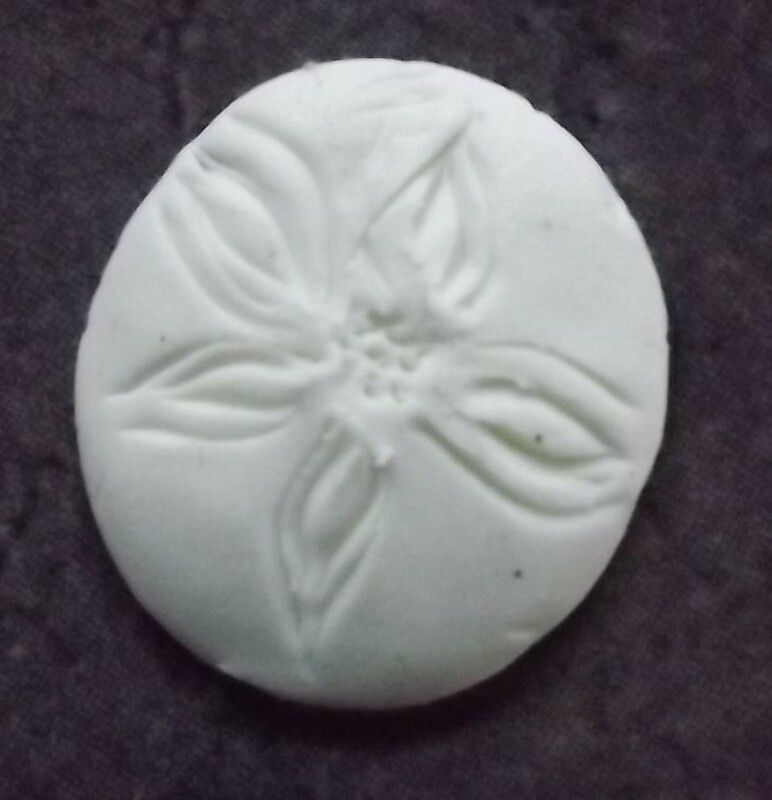 Ok, so last week I showed you how to make a polymer clay sand dollar. Would you like to learn something to go with it now? I had intended on showing you how I used the Sand Dollar but I have submitted that necklace to a magazine for inclusion and am unable to reveal it until I get a yes or no from them. Keep your fingers crossed for me. I will get something published before the year is over, that’s my New Year’s resolution. I’ve been very sick the last ten days so I haven’t felt up to creating or working on my website or Etsy shop. finally feeling better and ready to show you something else to try. 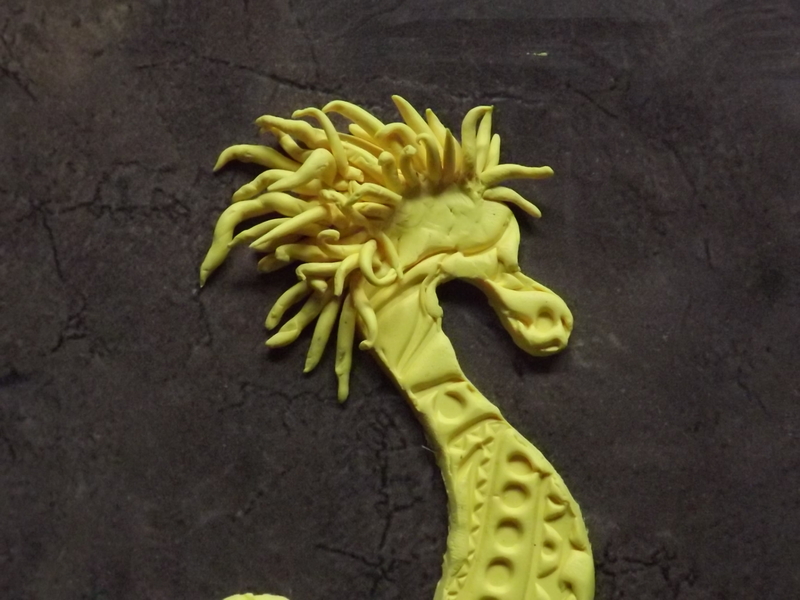 OK, back to the lesson now, I have designed a Sea Dragon for you today. 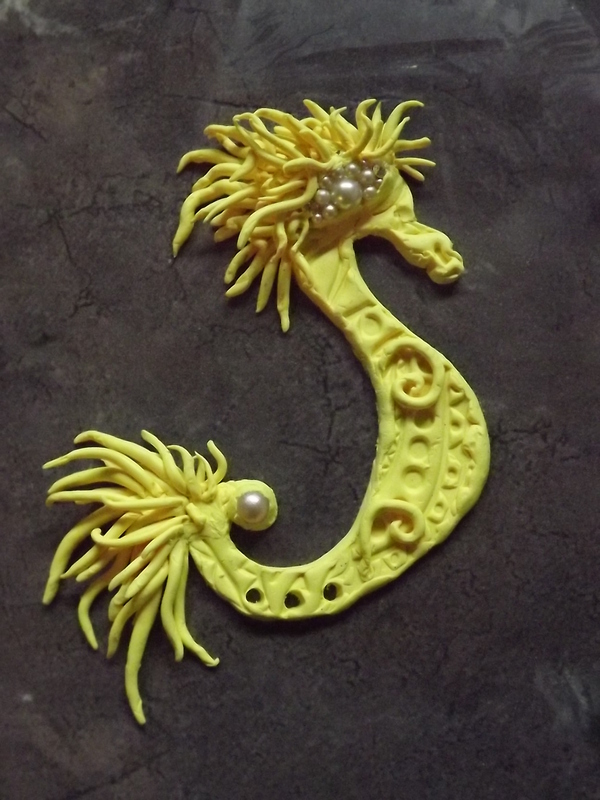 I made a beautiful Seahorse to share but that one is on the necklace mentioned above. 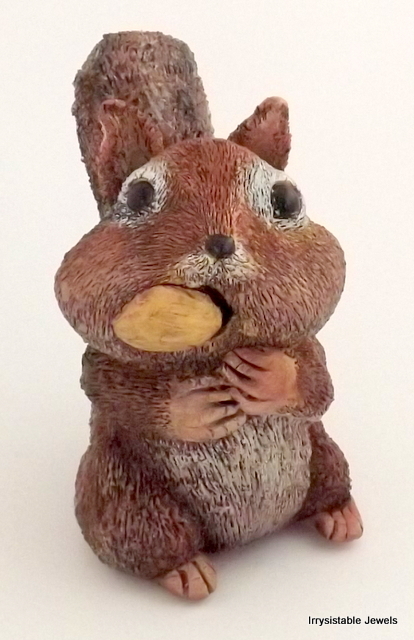 I promise I’ll share it when I can but until then we can make this little guy. There’s no right or wrong way to do this so put your fear aside and just have fun with it. First you’ll need some conditioned clay. Here I am using a bright yellow (shows up well for the camera) but you can choose any color you’d like. I then flattened it with my pasta machine on the highest setting but a rolling-pin works too, just takes a bit longer. I bought this great texture mat from a wonderful little shop called BSueBoutiques and figured this was a great time to use it. Anything that will give you some texture will work though. 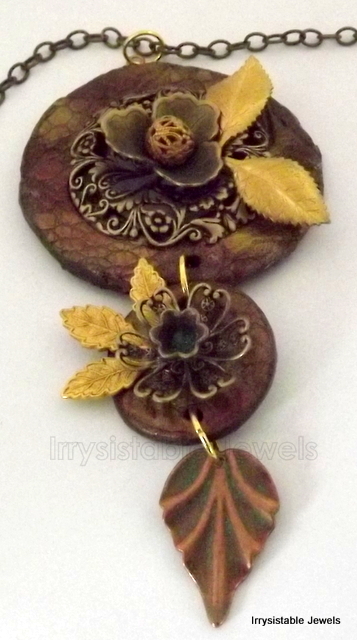 Lace, brass stampings,just about anything will do. Look around your house and you’ll be surprised what you can find that will make a pattern in your clay. There are a few handy tools I use, but mostly I use my hands. 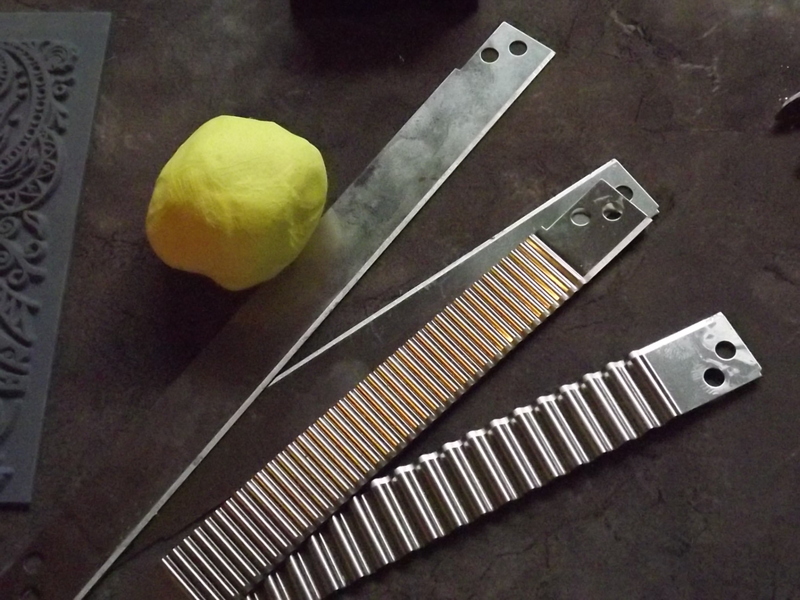 A razor blade is something you will need to cut out the shape or a very sharp knife. I started out with a toothpick and a pocket knife for tools so use whatever you can find and remember there are no right or wrongs here. 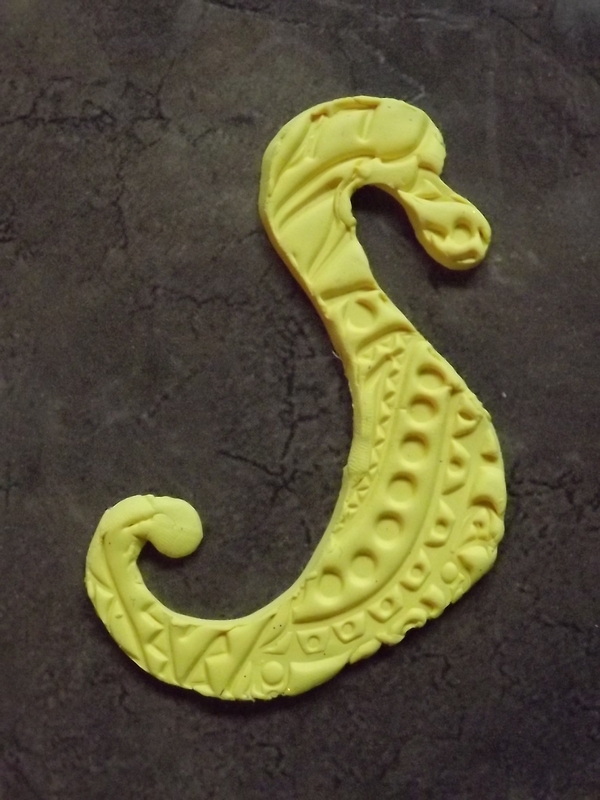 Now let’s cut out the basic shape of our little Sea Dragon. Yours does not have to be exactly like mine, in fact, it’s better if it isn’t since this is your Creation and it should reflect you. 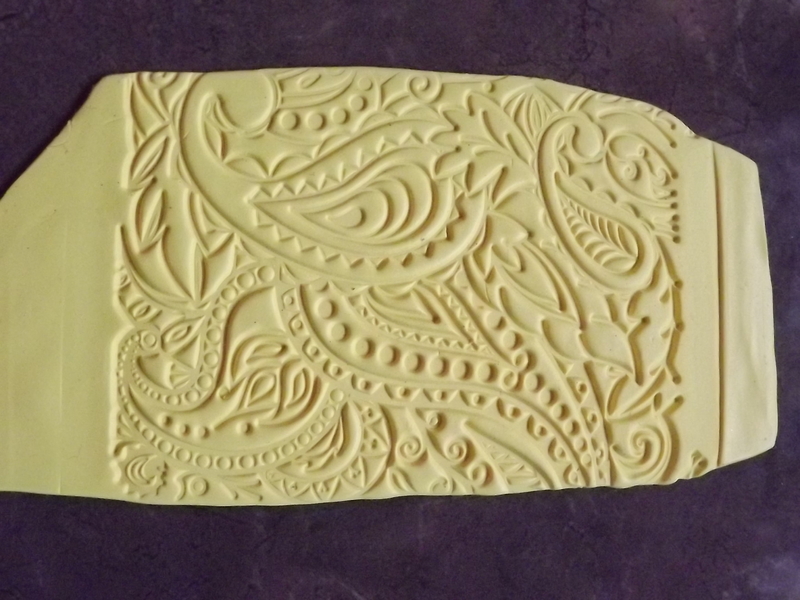 Just play around with the clay until you find a shape that works for you. That’s the best part of working with clay, you can just ball it up and start over if you don’t like it. Here’s the shape I ended up with. Feel free to print this out and use it as a template if you’d like. Lightly roll the edges with your fingertip to smooth out the blunt cut a bit. Now comes the fun part, Let’s decorate this little beast. 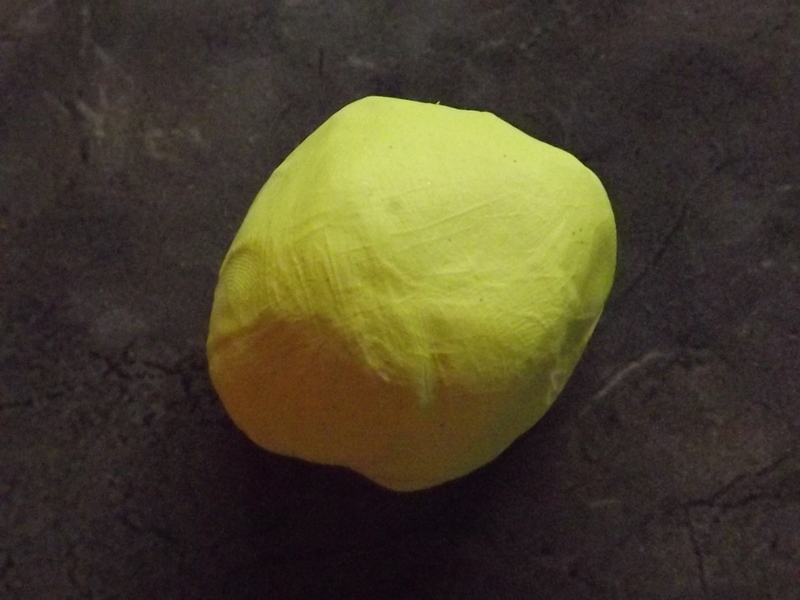 I formed a mane using small balls of clay rolled into a cylinder shape and pressed onto the head. Make your Sea Dragon with as big or small a mane as you please, or maybe not at all if that’s what you like. Try not to make these too thin at the tips or they will not be strong enough after baking. I start out with a long pretty thick layer of tendrils on the bottom and keep adding tendrils varying in size from large, medium and finally small in the direction of the face. This adds lots of dimension and a little drama to the creature. When you are satisfied with the way the mane looks why not go for a little on its tail as well like I did here. I like the way he’s taking shape now. Now comes the really fun part. 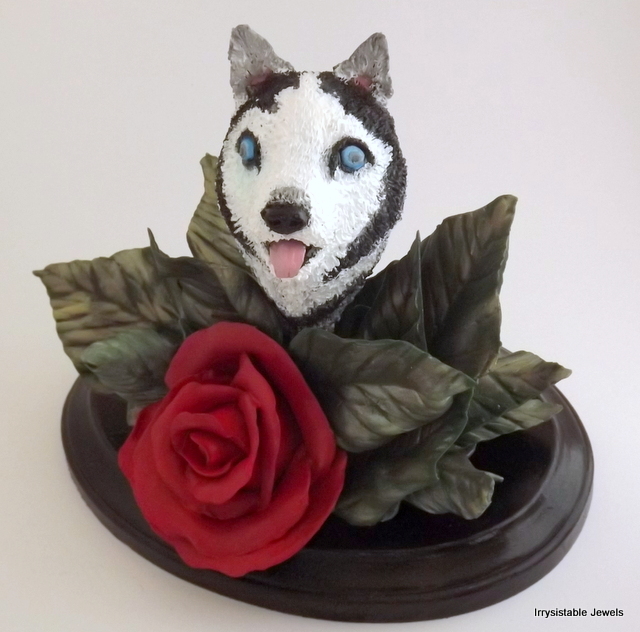 Let’s embellish him with pearls, crystals, beads or whatever you’d like (but remember he needs to be baked so keep that in mind when you add things). Here I’ve added some pearls and a few small crystals. 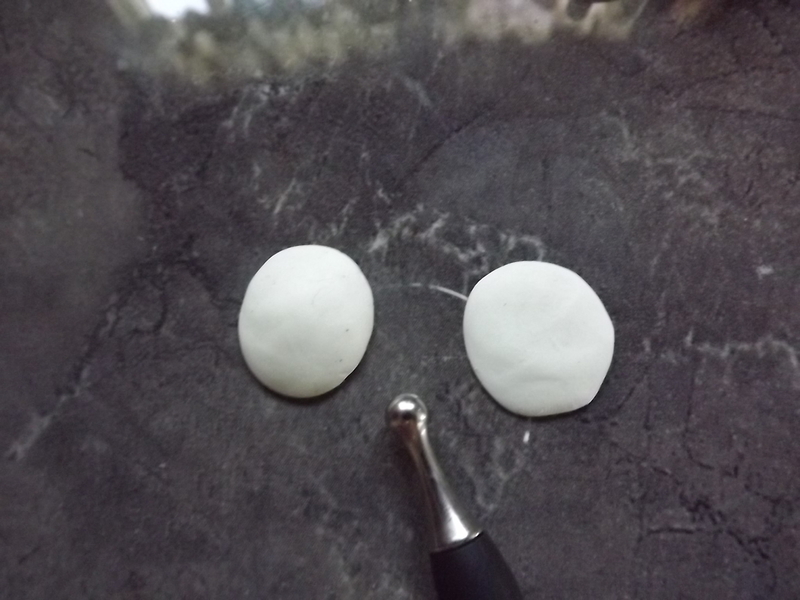 When adding beads and such that will be baked into your creation you’ll need to adhere them with a little extra clay. I simply wound a couple of pieces of clay like the tendrils we made around the bead and then smoothed it down with my fingertip a little. 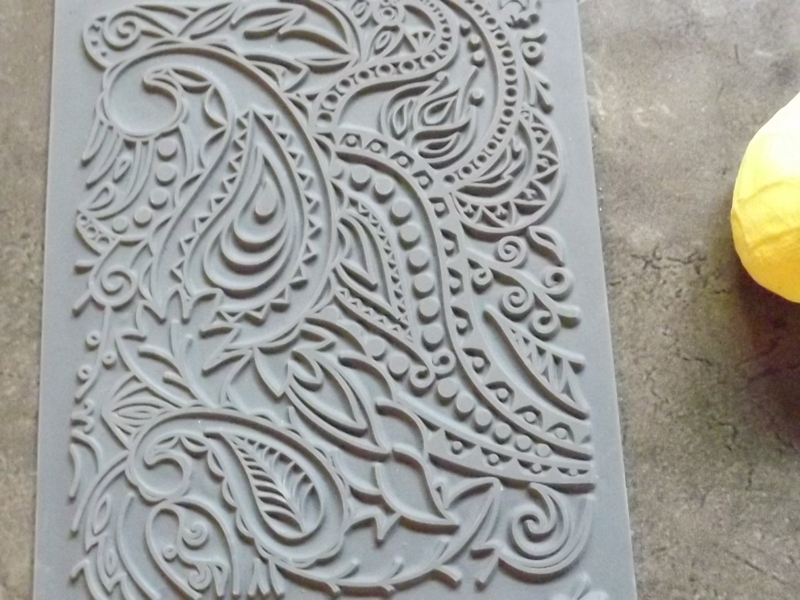 You could also just make an impression with the stone or bead and glue it in after it’s baked if you so choose. I plan on adding some chain or beads when I’m finished so I created three holes for that in the tail. Better to add your holes before baking I think. You can see I used some tendrils on the body in a curly fashion but I didn’t like the look and have removed them from mine. Needs a little more bling don’t ya think? Now that’s better! I also did a little fixing on the face too. I used a red crystal for the eye and built the area up with a small amount of clay. Just make some very small tendrils and adhere them above the crystal or bead and smooth it down a little. I did the same for the nostril too only a smaller crystal was inserted. 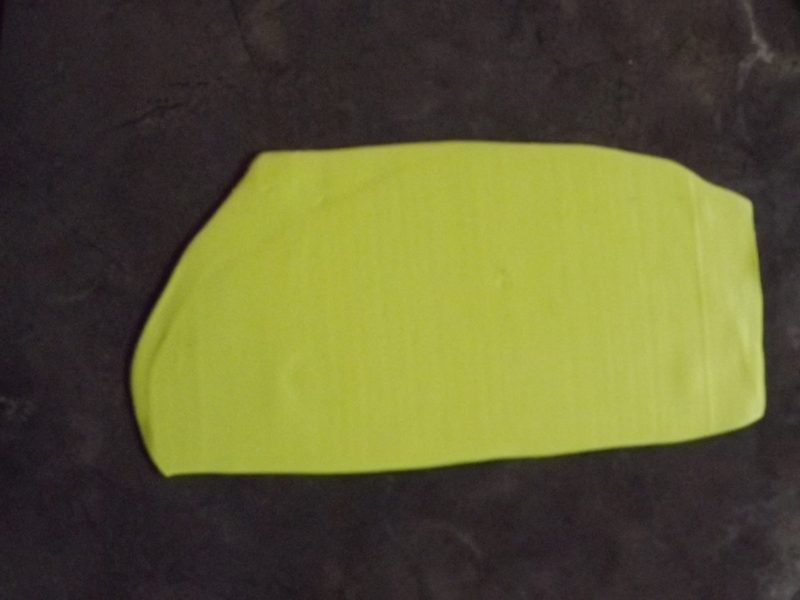 I hand formed a small fin and attached that into the middle of the back toward the edge. I think mine is done. How bout you? I always paint mine before putting it in the oven but you can certainly wait and paint it after baking if you’d prefer. I think I’d like my Sea Dragon to have some splashes of orange and red on him. 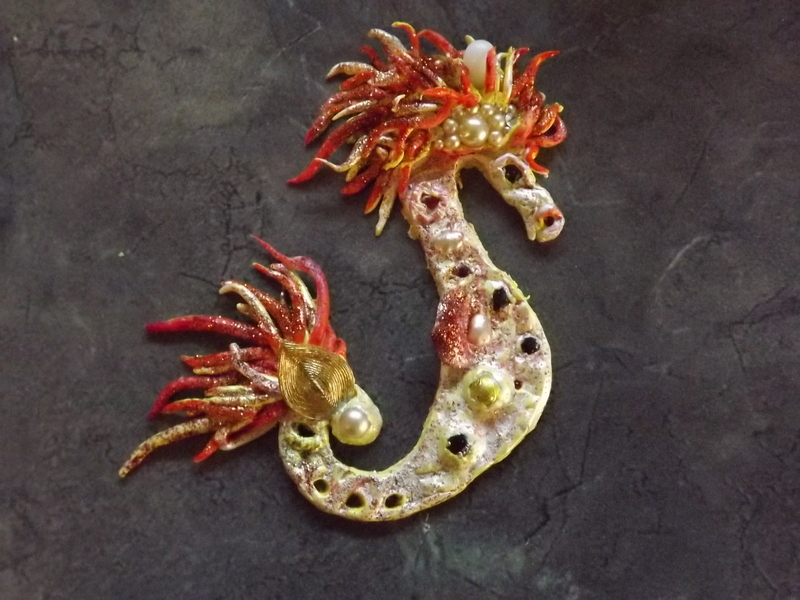 Choose whatever colors you think would enhance your Sea Dragon and give him a little sparkle. I love adding fine glitter to my creations too! This yellow was just a little too bright for my liking so I went over the body and face with a touch of Viva pearl precious metal colour. I then added some orange and a little red acrylic paint to the mane before putting him in the oven on 275 degrees for about 35 minutes. 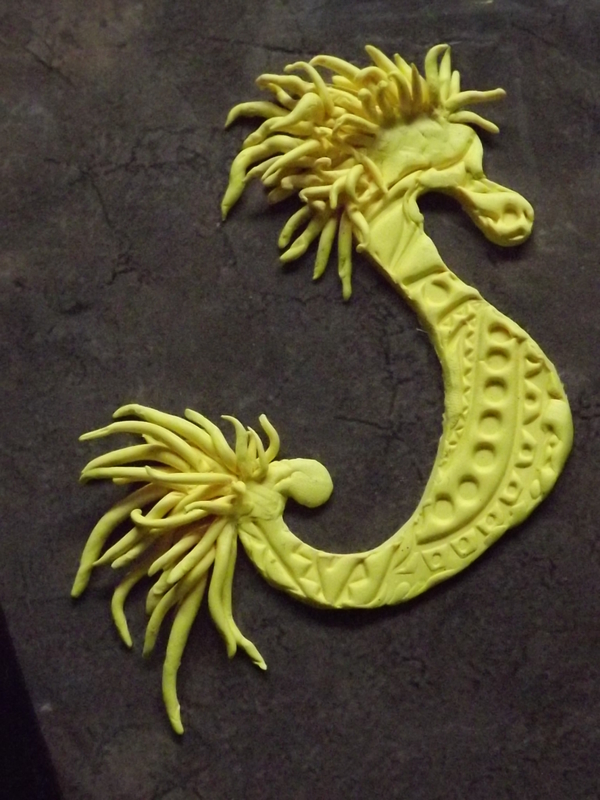 Here’s my finished Sea dragon. 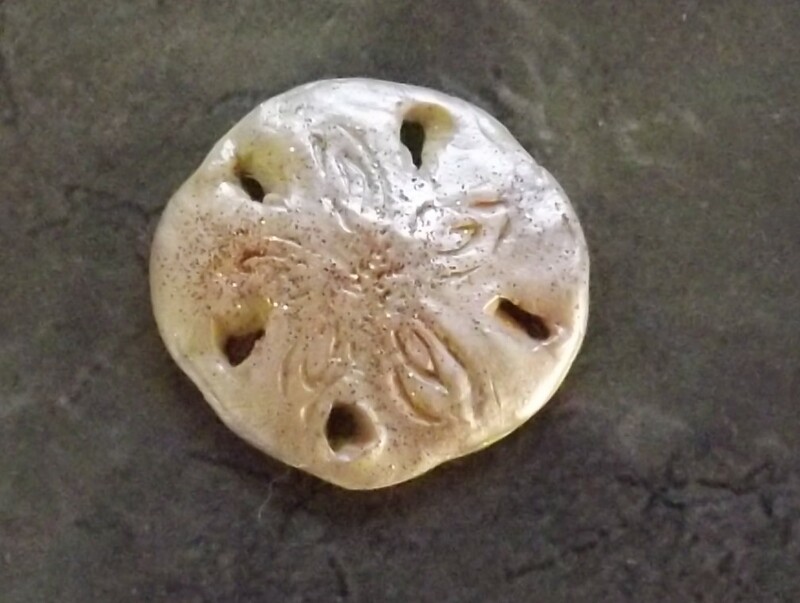 I’m working on a new polymer clay necklace to add to my Etsy store and thought I’d take a breather and teach you how to make a Sand Dollar out of clay. It’s easy and anyone can do it! Nothing in nature is identical so only happy accidents can happen, therefore you can do this one without fear. First you’ll need some polymer clay. 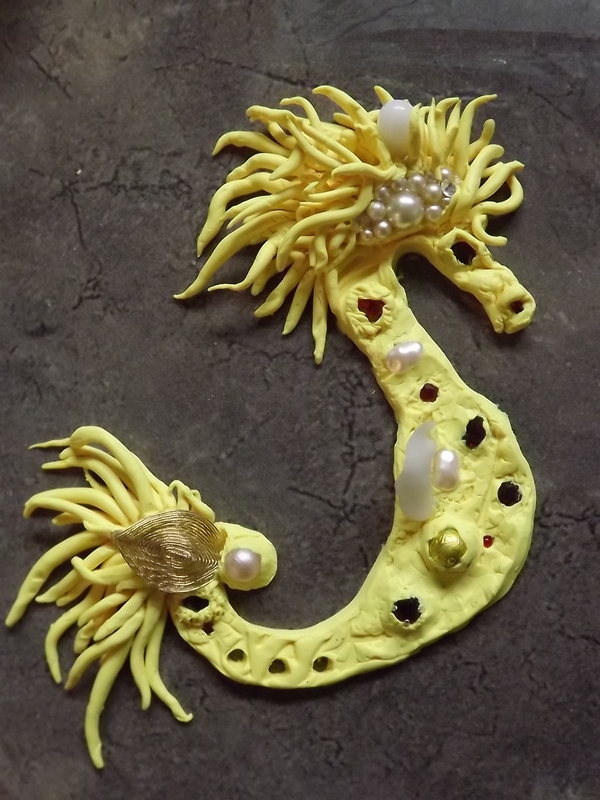 I personally use sculpey but any clay would work. I’ll be exploring the different kinds of polymer in the near future. Make sure your clay is well conditioned and ready by working it in the palms of your hands until it is soft and malleable. As far as tools go, you can use whatever works best for you. I started out with only a pocket knife and a toothpick but my dear Husband bought me some carving tools for Christmas, so I have graduated to using those now. I’m a firm believer in using whatever you can find that will give you the effect that you’re looking for though and have used some pretty unconventional items in my creations. 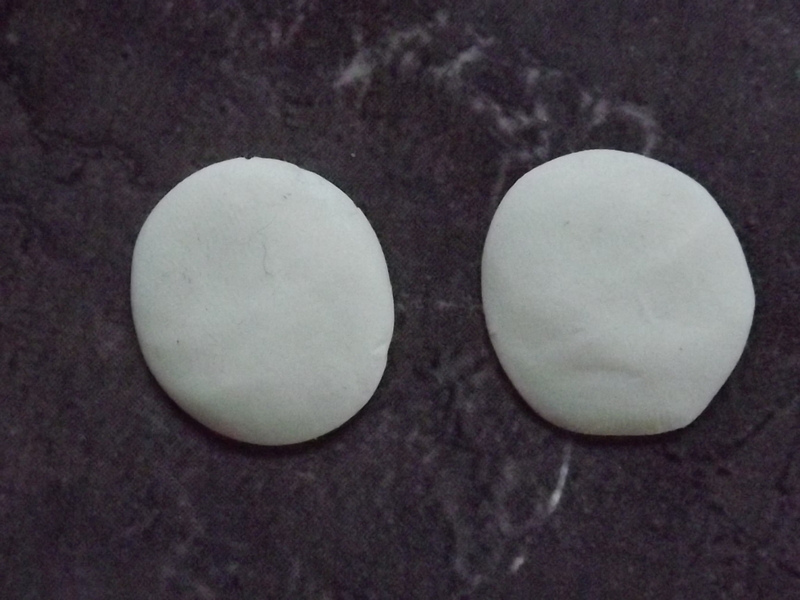 Pinch off enough clay to form the size of Sand Dollar you’re thinking of and form that into a small ball. 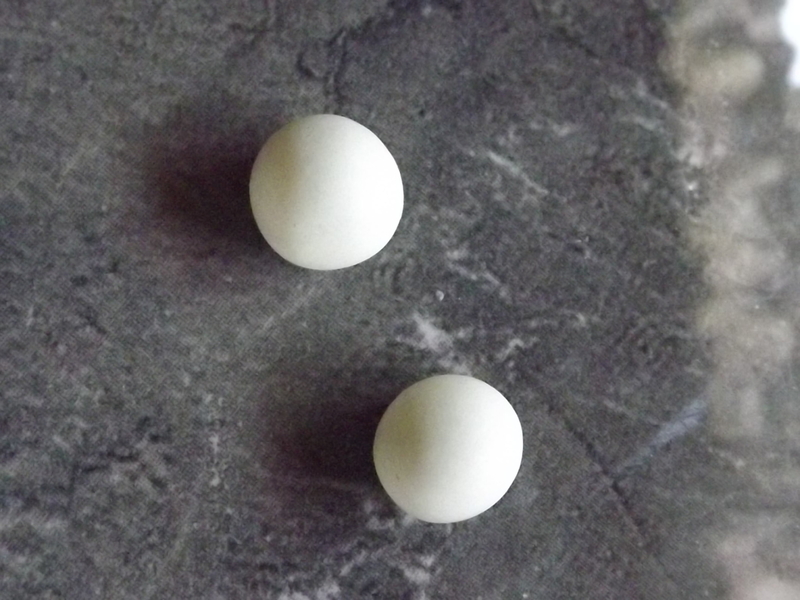 Create one more small ball and flatten both out until they are pretty close to the same size. Don’t worry about the edges at this point. No need for a perfect circle here. 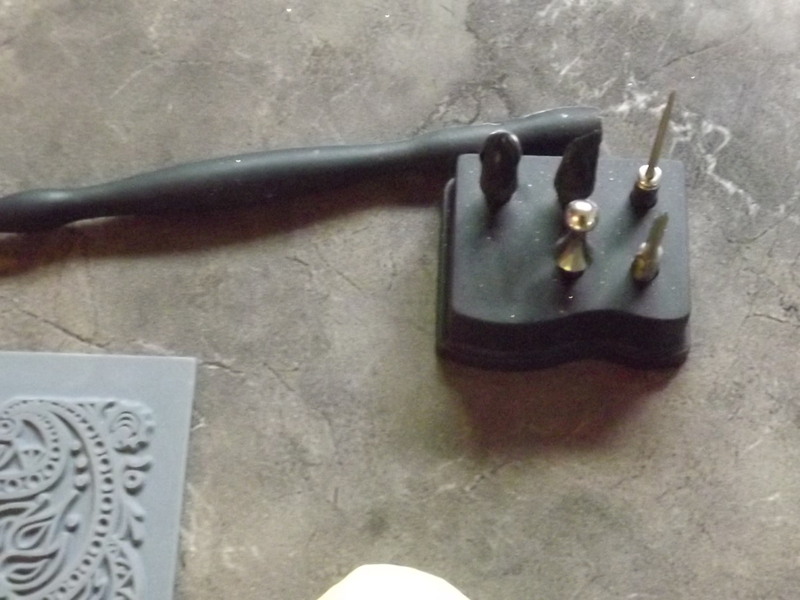 Now with whatever you chose for a tool, I am using a clay stylus here, create the little star flower shape on the top of one of the circles. Usually there are five petals and smaller petals inside those, but this is your Sand Dollar so be creative here if you’d like. I created little dots in the center of mine with the stylus. Now take the Sand Dollar you just marked and dome the underside a little. You can do this with just your finger. Just a small dome though as Sand Dollars are not flat and not extremely puffy either. Attach the other flattened circle to the bottom of the domed piece and carefully pinch the seams together until the seams disappear. Very carefully, with a razor blade or sharp pick, cutout the holes through both layers. 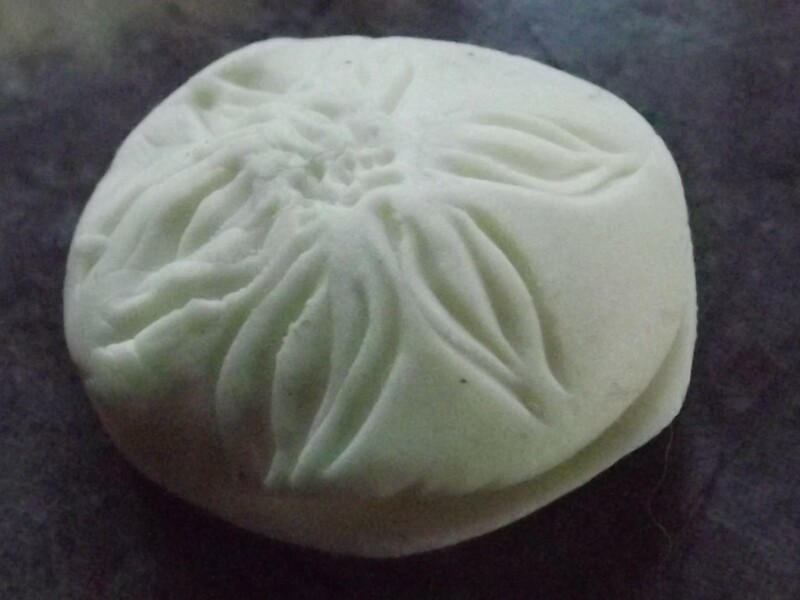 A little tricky to do without messing up the top but just be gentle with it and you’ll have a gorgeous Sand Dollar. At this point, you could add anything you’d like to the top, like stones or crystals. Make an indention as big as the stone and glue the stone in after the baking process or leave the stone in place and anchor it with more clay. Either way works, but I find that taking the stone out and glueing it back into place shows more of the gem and it’s my preference. about this next phase but personally I like to paint my pieces before I bake them. At this stage you can add some glitter,paint or more texture. I added some pearl paint, a little copper glitter and a slight dusting of peach powder to this one. When you’re happy with the outcome, pop it in the oven on 275 degrees(if you are using sculpey clay, check the type of clay for the instructions on baking what you are using as all are a little different) for about 35 minutes. I will typically add more details to mine after it’s taken out of the oven until I get the desired effect and then cook it again. I like to seal my pieces with a clay sealant before I add any embellishments like gems, or stones. Let your piece dry and set before adding it to any jewelry components. I am so impatient, I had to learn this the hard way! I’d love to see your finished Sand Dollars. I’m hoping to do many more this year and I promise I’ll get better at them. Maybe I will learn to do a video as well in the near future. I hope you enjoyed this tutorial and have fun making your own Sand Dollar. I’ll post my finished necklace as soon as it’s finished so you can see how I used my sand dollar in Jewelry.